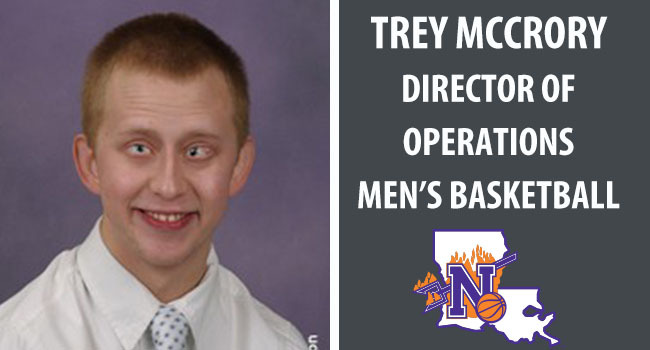 McCrory, a legally blind graduate student at Northwestern State, has been promoted from graduate manager to director of basketball operations for the Demons by head coach Mike McConathy. Last season, McCrory was named a finalist for the “Most Courageous Award” given to an NCAA Division I basketball participant by the U.S. Basketball Writers Association. In his new role, McCrory will add responsibilities to the duties he was performing for the NSU program. He is a primary administrative aide to McConathy and the coaching staff, coordinating daily schedules for practice and travel, among other functions. “Trey is one of the most remarkable people you’ll ever meet,” said McConathy. “He inspires everyone around us because he refuses to accept limitations. He works long hours, very diligently, and is a key cog in our program because of who he is and what he does and how he does it. McCrory, a Natchitoches Parish native, has officially been on the Demons’ basketball staff for four full seasons while he earned his undergraduate degree, and is on track to receive a master’s degree in sport administration this year. His vision is adequate only for 5-7 feet around him, although he does require magnifying devices to read. His family started bringing him to NSU home basketball games about a dozen years ago. When the Demons won back-to-back Southland Conference championships in 2005 and 2006, McCrory developed bonds with much of the team, notably with forward Jermaine Spencer.McCrory would join the team and coaching staff for postgame visits in the Demon locker room and through the years maintained relationships with head coach Mike McConathy and others in the program. In his sophomore season at NSU, the Demons won the 2013 Southland Conference Tournament and advanced to the NCAA Tournament in Austin, Texas. McConathy invited McCrory to join the official team party for the trip. Later that spring, McCrory approached assistant coach Bill Lewit asking to join the basketball staff, and came on board for the 2013-14 season as a student manager. He earned his undergraduate degree in a dual major of psychology and addition studies with a 3.4 grade point average. He transitioned into a graduate manager role, with more responsibilities, upon earning his undergraduate degree. Last season he became more immersed in team travel and other operational functions of the program. The Demons are preparing for the 2017-18 season, which begins with a Nov. 10 visit to Texas before home games Nov. 12 against LeTourneau and Nov. 17 against Rice at Prather Coliseum.